1977: Founded in February by then 13-year old Jonathan Rotenberg to be a resource for anyone to feel comfortable with computer technology, exchange information with fellow users, and learn from each other's successes and failures. 1978: Membership of 73. First mimeographed copy of BCS Update printed in November. First BCS telephone line installed - in Jonathan's bedroom. First meetings held in the Commonwealth School cafeteria. 1979: First BCS user group forms - for the Commodore PET computer. First BCS book published; a directory of local stores, consultants, and services. Membership: 300. VisiCalc introduced at BCS meeting by Bob Frankston and Dan Bricklin. 1980: The BCS is incorporated and rents a small downtown Boston office. First part-time employee hired as Jonathan leaves for Brown University. Membership at 1000 with nine user groups. 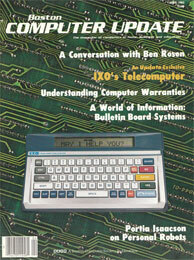 BCS Update becomes Computer Update, a glossy 34-page magazine. 1981: First full-time employee hired. Official non-profit status granted. Calendar launched and cursor button logo adopted. Membership is growing rapidly. 1982: Membership grows to 3,000 with 13 user and special interest groups. Dues were $18. First electronic bulletin board started. IBM introduces its new personal computer in November with the group starting in January 1983. National media attention. 1983: Membership doubles to 6,300. Two more employees hired. 20 user and special interest groups. First regional chapter started in Providence, Rhode Island, under the auspices of the IBM Group. 1984: Office moves to larger office in same complex as membership hits 10,000. Resource Center opens. 29 use/special interest groups. First Buying Guide published. The Macintosh computer is introduced at a BCS meeting and the Mac Group starts. 1985: Membership at 17,000 with 41 groups. Activist newsletter launched. The book Things the Manual Never Told You, co-written by many BCS activists, is published by Addison Wesley. Professional staff of seven employees. 1988: Membership goes over 30,000. Computer Update changes back to BCS Update. NeXT introduces its computer at one of the largest meetings ever with almost 3,000 people lined up at Symphony Hall in Boston. Calendar lists about 140 events. Public service intiiatives begin. 1989: The Massachusetts Special Access Technology Center (MASTAC, an organization assisting disabled children and their teachers and families get access to computer technology, comes under the BCS umbrella. Membership peaks in June at 31,100 with dues at $40 for an individual membership. Over 20 electronic bulletin boards and 700 activists. Revenues over $2 millon. 1990 Rotenberg moves from president to chairman. Tracy Licklider named president. Declining membership and local economics force scaleback of BCS Center. Membership at 26,800. Dues reduced to $39. 1991: BCS office moves to One Kendall Square in Cambridge. Membership shrinks to 24,400. IBM Group moves office to larger space with classrooms, still in Newton. Joint publications (BCS Tech, BCS Professionals, BCS Computers) launched. Licklider resigns; search for new president begins. 1992: Membership at 23,500. HP executive Bob Grenoble named president in May. Macintosh Group office moves from Somerville to Cambridge and their bulletin board logs its 500,000 call. At year-end employees numbered at 20 and activists topped 800. The Resource Center began providing daily access to members. Alliance formed with The World for Internet access. Member insurance and an unemployment service. 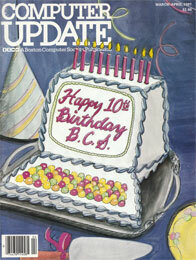 1993: Computer Update becomes a new flagship publication - BCS Magazine. Seventh annual MegaMeeting, CompuFest, and a Computers & Social Change Conference. President Bob Grenoble differs with BCS Activists as to BCS direction, tries to change computer platform emphasis - Mac, PC, Amiga, etc. Boston Globe quotes Grenoble as saying computers are not very useful to average person. Activists resist and call for Grenoble resignation at a public meeting videotaped by members of the Desktop Video Group. 1994: Grenoble resigns. Eighth annual MegaMeeting has 10,000 attendees, 150 exhibitors, 150 seminars and workshops. User group support director Pam Bybell becomes president. 1995: President and Board find it difficult to cut back staff and operation to meet declining membership and revenues. 1996: Pam Bybell resigns. Board votes to close BCS. *= new or only recently established group.